Once the request was made, the search was on for the perfect energy bar recipe! What I found? Many were just too sweet! Two cups of sugar in an energy bar? No thanks! This much sugar is not necessary or even healthy for anyone! Others were more like a dessert bar and not the least bit balanced or nutritious. None of them provided the nutrition and energy needed for a successful training ride — especially for someone riding or exercising with diabetes. You can imagine my delight when I found the recipe I am about to share with you. It not only uses just 1/4 cup honey (or sweetener of your choice) but is loaded with protein and fiber and a nutritious amount of carbohydrate and fat. I also LOVE that the recipe includes oats! Yum! (for an oat sensitivity consider using quinoa flakes). I chose to use almond flour as 50 – 100% of my dry base ingredient to reduce the carbohydrate amount and increase nutrients. Almond flour is a super-food after all! What you get is an energy bar that is not only great tasting but also healthy and perfectly successful at maintaining good blood sugar levels with exercise. They are also just an all-around good snack that will not wreak havoc with your blood sugars but will actually hold them at a good level. I have been (happily) eating them in the days leading up to this post and been amazed at my steady blood sugars and how satiating they are too! 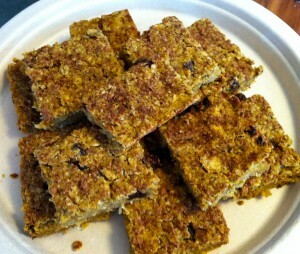 Here is a link to the original recipe by No Meat Athlete called The Ultimate Energy Bar Formula. Below are the two versions of energy bars I created with their energy bar formula. Ingredients can easily be chosen for this recipe that are gluten free (the two recipes shown below are both gluten free). As mentioned above, if you are intolerant of oats, try quinoa flakes as a substitute. Also worth noting – there is a spreadsheet in the original post by No Meat Athlete where you can enter in the nutrition facts of the ingredients you choose to calculate the nutritional values (grams of carb, fiber, protein etc) of these bars. 1/2 cup maple syrup (I filled the 1/2 cup measure cup 1/3 full with pumpkin and poured maple syrup in to make 1/2 cup). 1 tsp. pumpkin pie spice (for stronger flavor – add more to taste. It was too late for me to add more spice so I sprinkled pumpkin pie spice generously on top of the bars just before putting them in the oven to bake – this turned out great!). Special notes about preparation & baking: For both recipes I had to add about 1/2 cup filtered water at the end as it was a little too dry. My oven also required me to bake them a little bit longer – for about 25 minutes. For version two I followed the steps in the recipe until I got down to adding in dry base ingredients. I mixed in the almond flour but waited to add the oats until the very end when I lightly pulsed them in with the stir-ins I used. I like the chunky texture of oatmeal in my baked goods. The protein powder in version one gave the bars a distinct “protein powder” taste and reminded my husband and I of the Power Bars we used to eat in the 90’s. I hope you enjoy these delicious, healthy and easy to prepare energy bars as much as my husband, friends and I all have! I am looking forward to making pumpkin maple energy bars next! (recipe found on link to original post). 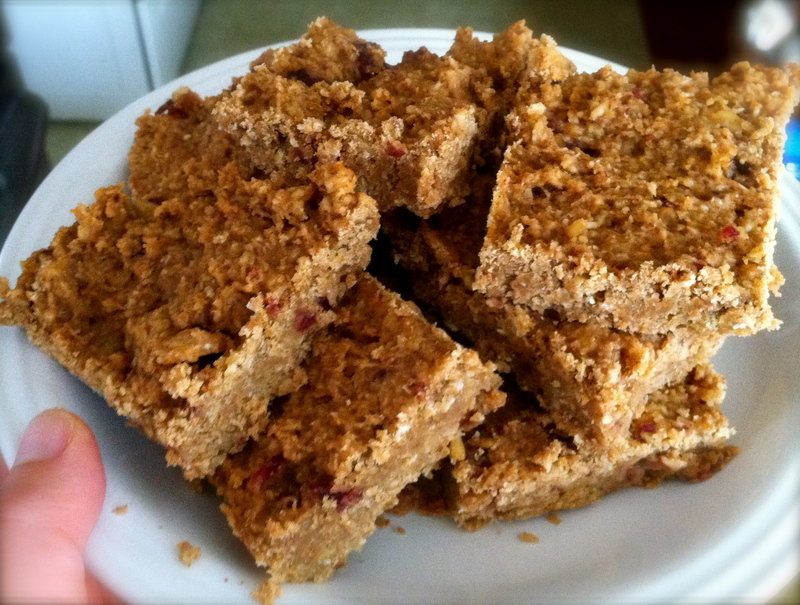 Have fun experimenting in the kitchen and creating your own perfect energy bar! I would love to hear all the wonderful combinations you come up with – please share with us in the comments section below! Happy training! Please join our community on our Facebook page for Diabetes Light! Come to learn, be inspired & experience community + find out when new articles post!! Cynthia celebrated her 25th year of living with Type 1 diabetes in February, 2012. She loves yoga, cycling and long walks with her husband & dog Jonah. She participated in her first ADA Tour de Cure in 2011 and had an amazing experience as a Red Rider. She is also passionate about behind the scenes stuff to make the Tour a success and currently serves on several sub-committees. Please send her an email (diabeteslight@gmail.com) to learn about some of the ways you can help with the Tour de Cure & meet a lot of fun and passionate folks too. 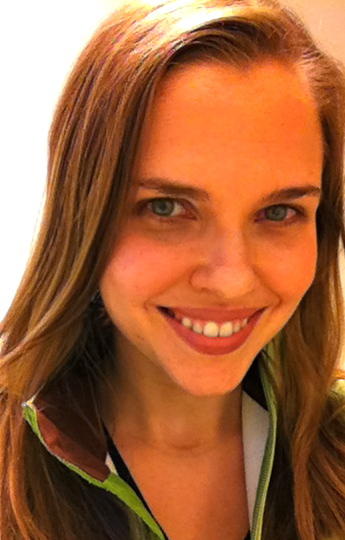 Cynthia loves meeting new people — so please say “Hello” on June 1, 2013! Happy riding! These look wonderful, but I’d like it if you could include nutritional information. WE really do need nutritional information to ensure it’s in our guidelines. Can you help?